See also: Azalea Festival; Eastern Music Festival; Festival for the Eno; Folk Art; Folklore; Folkmoot USA; Folk Music; Hollerin' Contest; MerleFest; Mountain Dance and Folk Festival; Mule Day; Old-Time String Band Music. The antecedents of contemporary North Carolina folk festivals are traditional events that brought people together in a spirit of celebration. Although centered around necessary labor, communal gatherings such as cornhuskings enabled people to socialize when the work was done. Community dances, usually held in private homes, offered citizens another opportunity to gather for pleasure while enjoying music and dance-two important components of modern folk festivals. Other events, such as fiddling contests, united musicians and listeners and introduced a spirit of competition. Many early folk festivals were organized by people committed to the continuation and promotion of regional folklore, folk music, and folk art. Beginning in the 1920s, enthusiasts presented these art forms in settings similar to those of public concerts or lectures. In this way, their merits-often disparaged in comparison to "higher culture"-could be made abundantly clear. Reportedly, the first such festival in North Carolina (and the first in the nation) was Bascom Lamar Lunsford's Mountain Dance and Folk Festival, held in Asheville in 1928. In 1948 Lunsford organized the first Carolina Folk Festival at Chapel Hill, a well-attended event that continued into the 1950s. From these initial gatherings, and as public interest grew, a wide variety of festivals appeared in North Carolina, some developed through local interest and others staged as much for outside visitors as area residents. Many have celebrated the state's agricultural heritage. In 1969 the first National Hollerin' Contest took place at Spivey's Corner in Sampson County to preserve the art of hollering, which farmers once used to communicate across large fields. Mule Day at Benson in Johnston County centers around the long-ago power supply for the state's agriculture industry. Celebrations of the natural environment, such as azalea festivals, dogwood festivals, and harvest festivals, are also common throughout the state. Festivals centering on music and dance remain among the most popular in the state. The Lake Eden Arts Festival, placing equal emphasis on dance and music, occurs twice a year at Camp Rockmont in Black Mountain. The spring festival coincides with Memorial Day weekend, and the fall event is held in mid-October. The 600-acre property is the former site of historic Black Mountain College. Musical offerings at the festival have included waltz, swing, clogging, Cajun, Zydeco, African, Latin, Celtic, western, and capoeira selections. During the festival the dance schedule for Brookside Pavilion is nonstop, as is the music schedule at Lakeside Stage and Eden Hall. The Poetry Tent features readings by poets as well as activities geared for children and more opportunities for music. In the field next to Lake Eden, juried artists offer their crafts for sale; there is also a place for children to sell their handicrafts. Some North Carolina folk festivals draw their inspiration from the changing of the seasons or just the simple need to get outside before the arrival of summer's sweltering heat. When spring comes around, the Havelock Spring Festival helps North Carolinians celebrate. Inaugurated in 2005, the family showcase runs in conjunction with the annual Marine Corps Cherry Point Air Show. Started in 2004, Brevard's White Squirrel Festival in late May is a good excuse to get "nutty" during mild spring days. Events include live music, regional artists, and tours to see wild white squirrels. Almost everything at the festival bears the squirrel theme, making it, in the words of the planners, "western North Carolina's squirreliest event." Durham's Festival for the Eno is one of several events originating from an impulse to conserve and celebrate natural resources, and organizers donate its profits to the preservation and acquisition of land in the Eno River State Park. With multiple stages for a wide range of performers and hundreds of local artists and craftspeople, the festival, now well into its third decade, is the highlight of the outdoor Durham festival scene. Similar to the Eno festival is the Lake Lure Festival of the Arts, held annually on Labor Day. Life-size sculptures, hand-crafted jewelry, and decorative and functional arts pieces are showcased at this "food and fun" festival nestled in the Blue Ridge Mountains. The popular Autumn Leaves Festival in Mount Airy signals the end of summer with an outdoor celebration featuring arts and crafts displays, as well as its biggest draw-the natural grandeur of the changing foliage. The North Carolina Folk Arts Festival in St. Pauls (Robeson County), the Festival in the Park in Charlotte, and MUM fest in New Bern are also representative of gatherings attended by large numbers of North Carolinians and out-of-state visitors. 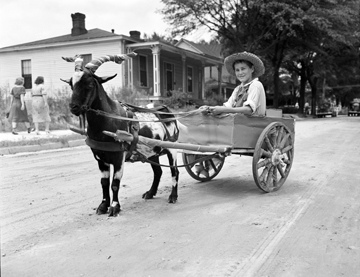 Wilson Farm Festival, Wilson, NC, August 1938, Goat Wagon, photo taken by Baker. Conservation and Development Department, Travel and Tourism Division Photo Files, North Carolina State Archives, call #: ConDev1403A-A . Available from http://www.flickr.com/photos/north-carolina-state-archives/2388293328/ (accessed June 15, 2012).